Businessweek ran this piece just 5 days ago. I think it would need a rewrite today. It has been a lousy few years for much of the media, and 2008 has offered no respite. But to quote the hideous '70s band Bachman Turner Overdrive, b-b-b-baby, you just ain't see n-n-nothing yet. Because on top of the wrenching change affecting essentially every non- online media, here comes a very scary-looking economic downturn. Think of the recession, says Barclays (BCS) analyst Anthony DiClemente, "as a vine growing up a wall. Except instead of a healthy vine, like at Wrigley [Field], it's like—'feed me, Seymour'—from The Little Shop of Horrors." Forgive the surfeit of pop-culture jokes. I'm only trying to inject levity into an extremely grim picture. According to ad tracker TNS Media Intelligence, which provided all such figures for this column, automotive and financial services were the No. 1 and No. 3 U.S. ad categories last year. We all know what happened to the latter in recent months. In 2007, Merrill Lynch (MER), Lehman Brothers (LEH), Bear Stearns (BSC), and Washington Mutual (WM) spent $213.1 million on advertising. Even if those companies' new owners spend something to reassure old customers, you're likely looking at a nine-figure sum sucked out of the ad marketplace by those guys alone. And when major carmakers report sales drops of 30%, boffo ad buys do not follow. Ford Motor's (F) ad spending was down over 31% for the first half of this year. Car sales' slide has accelerated since. In case you're wondering, the No. 2 ad category was retail, which is now under severe pressure as consumers spend less. The consequences of all this contraction are readily apparent when you talk to key media executives. Magazines sell ads long before they appear, and advertisers already are making noises about cutting back in the first half of 2009, says one senior executive in that industry. "Everyone says they are going to keep advertising in a downturn," says another executive, who has run major sales organizations in different media. "But not everyone actually does it. That's just the reality of having to report earnings and profits." And while the wealthiest consumer may remain relatively untouched, those who have recently traded up to high-end products may slam the brakes on such consumption, raising chances that luxury advertisers will be affected, too. Food looks more likely to stay stable. One mordant TV executive puts it this way: "The auto industry is out. And Campbell's Soup (CPB) is in." Elsewhere, Barclay's DiClemente suggests, the slowdown's effects will move up a media ladder of sorts, starting with newspapers, magazines, radio, local TV, and then hitting broadcast and—possibly—cable TV. 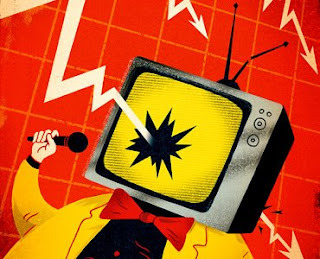 There's a "high probability," he says, that the "advertising malaise spreads to network TV"—the one long-running medium that's held steadiest as others have fallen off. DiClemente is forecasting a 5.5% pullback in ad spending next year, with only Web and cable TV posting ad upticks. It may be hard to conjure a scenario worse than today's, given what radio, local TV, and newspapers are currently experiencing. This has been a year in which many unthinkable things have happened—newspaper executives, for instance, mulling which days of the week they won't publish. But the coming downturn means that what once was unthinkable ... well, you better start thinking it. Fine is BusinessWeek's MediaCentric columnist and Fine On Media blogger .